The outside carillons ring five minutes before Mass calling us to worship. We should be in church and seated when the bells toll five minutes before the beginning of Mass. It is best to arrive a few minutes early for Mass and to use the extra time for personal prayer and to prepare to receive Christ. It is important that we show proper respect to the Eucharist while allowing others to worship without distraction. Fasting for one hour before Communion from all solids and liquids (except water and any medicine you might need to take) is a small sacrifice we offer to Jesus to show our respect and reverence for His true presence in the Eucharist. We dress with dignity in order to show our Lord that we have deep respect for the real Presence of His Body and Blood present in the Eucharist. God has given us the greatest gift, His Son, and in return, it is appropriate to present ourselves in proper clothes and attitudes as a sign of reverence and respect for this gift. Bless yourself with Holy Water upon entering and leaving the Church. The use of Holy Water to bless oneself upon entering Church is a reminder of one's Baptism and a gesture of purifying oneself before approaching the presence of God. When greeting one another in Church, keep your voice at an appropriate level. Nurturing the family community is indeed important, however, we must be mindful of the presence of Jesus in the Eucharist as well as being considerate of others who are praying in silence. If you are able, genuflect (on the right knee) before entering a pew as a sign of adoration and greeting directed towards the Divine presence of the Blessed Sacrament. It has also been a tradition to bow slightly at the mention of the name of Jesus. Both the genuflection and the bow are symbolic of one's humility in the presence of the Lord. We welcome all. Bring your whole family, including small children, to Mass with you. Encourage them to participate in the celebration and learn its meaning. If a child becomes fussy during Mass, please feel free to use the Nursery until the children are ready to return to the main church. The priest should be the last person to enter the church and the first person to leave at the conclusion of our worship. Ideally, we should be focused on the lector and listening to the Word being proclaimed rather than reading along in the missallette. Open your mind and heart and be attentive to the proclamation of God's word. Try to discover the meaning of these readings in your life. Each week spend a few moments pondering the Sacred Scripture readings or the homily, and discern the message that God specifically wants you to take with you this week. Respond with "Thanks be to God" following the first and second readings. These acknowledgments create openness to the indwelling of the message of God. Join in the singing of the Responsorial Psalm. This is a joyful response to the Living Word of God. Rise out of respect and prepare for God's message by singing the Alleluia verse. Following the reading of the Gospel. Glorify the Lord with the response, "Praise to You, Lord Jesus Christ". If you desire a resource to follow along with the Mass, missallettes are available in the pews. However, this is just a gentle reminder that missallettes are provided to be shared with everyone and are not to be removed from the church. If you would like a worship aide of your very own, we strongly suggest purchasing a year subscription to the “Magnificat”. Their website is: www.magnificat.com. 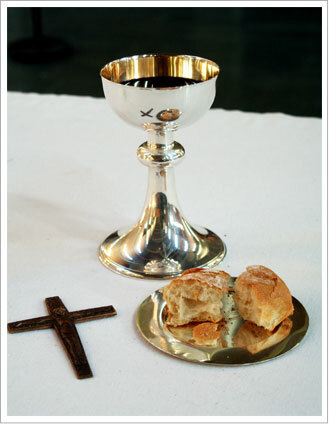 As Catholics, we fully participate in the celebration of the Eucharist when we receive Holy Communion. We are encouraged to receive Communion devoutly and frequently. In order to be properly disposed to receive Communion, participants should not be conscious of grave sin and normally should have fasted for one hour. A person who is conscious of grave sin is not to receive the Body and Blood of the Lord without prior sacramental confession except for a grave reason where there is no opportunity for confession. The frequent reception of the Sacrament of Reconciliation is encouraged for all. The Sacrament of Reconciliation is offered every Saturday afternoon at 4pm in the Chapel. Respond to the prayers being offered by the Celebrant. The prayers are offered on our behalf, and therefore we must be attentive and responsive if they are to have personal meaning for each of us. Profess your faith by saying or singing the great Amen. Our "Amen" signifies that we believe the Lord Jesus Christ is truly present; that simple bread and wine have been transformed into the Body and Blood of Christ. Receive the Eucharist with love and adoration. Respond "Amen" to the proclamation that what you are about to receive is the Body and Blood, Soul and Divinity of Christ. Those receiving in the hands should place one hand under the other and fully extend them to accept the Eucharist. If you prefer to receive on the tongue, be sure to move close to the Priest or Eucharistic Minister, open your mouth so that the Eucharist can be placed there easily and safely. We welcome our fellow Christians to this celebration of the Eucharist as our Christian brothers and sisters. We pray that our common baptism and the action of the Holy Spirit in the Eucharist will draw us closer to one another, and begin to dispel the divisions which separate us. We pray that these divisions will lessen and finally disappear, in keeping with Christ's prayer for us "that we may all be one". (John 17:21). Because Catholics believe that the celebration of the Eucharist is a sign of the reality of the oneness of faith, life, and worship, members of those churches with whom we are not fully united are ordinarily not admitted to Holy Communion. All who are not receiving Holy Communion are encouraged to express in their hearts, a prayerful desire for unity with the lord Jesus and one another. We also welcome to this celebration those who do not share our faith in Jesus Christ. While we cannot admit them to Holy Communion, we ask them to offer their prayers for peace and unity of the human family. Pagers & Cell Phones should be off or in an inaudible mode or better yet, leave them in the car for the hour so that you can give the Lord the glory that is His due.